Warning lights are your car’s way of telling you something’s wrong. It’s an extremely important indicating system that can save you a possible break down or some very expensive repairs, but it’s no good if you can’t understand what it’s trying to tell you. Some lights are obvious, like the seat belt light, but others can be a guessing game…(what’s a circle with little dashes around it supposed to mean???) Below are some common (and some not so common) warning and indicator lights. If you don’t see what you’re looking for below, you can always ask us. Either use the form at the bottom of this page, or better yet, take a picture and e-mail it to us at s.h.i.c@comcast.net. We’d be happy to help. The following indicators have to do with the various braking functions of your car. These are different versions of a brake lining or brake pad light. They all indicate that your brake pads are wearing thin and should be replaced in the near future. Some systems (like BMWs for example) give you warning almost 2,000 miles before they need changing, others might give you less. If one of these lights comes on, the best idea is always to have a professional take a look and let you know how soon you need to have the brake pads replaced. (NOTE: Some cars use the light that reads “BRAKE” to indicate only that the parking brake is engaged and use another light to indicate that the brake pads are worn. Refer to your Owner’s Manual to figure out what that light means in your car). These lights could also indicate that brake fluid is low. Some cars have a specific light for this, (one is pictured in the “Fluids” section) while others use the same light to indicate several different potential problems. If your car relies on just one light, it could mean that the brake pads are low, as mentioned above, or it could indicate a more serious problem. Check the brake fluid and add as needed if it is low. 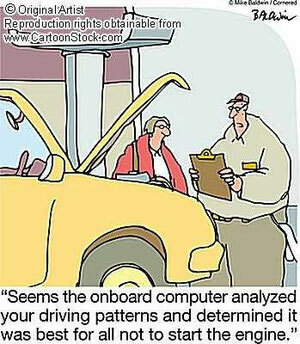 However, monitor the brake fluid level and the situation closely! Brake systems work via hydraulic pressure, and if you loose enough of that pressure your ability to stop could become compromised, either in part or altogether! If there is any change in the way the brake pedal feels when you step on it, especially if it is very low or even goes to the floor, your car is probably not safe to drive! Take it to your shop immediately, but HAVE IT TOWED; DO NOT TRY TO DRIVE IT!! NOTE: Some systems, such as several model years of BMWs use different color brake warning lights to indicate the severity of the problem. If the brake light comes on YELLOW, it indicates that your brake linings (brake pads) are low and should be changed in the near future. However, if that same light comes on RED it indicates a more serious brake problem, like low brake fluid. As always, it’s best to refer to your owner’s manual to determine if your car uses this type of warning system. These lights are not to indicate a problem, but rather to notify you that the parking brake is engaged. This is just a little helper so you don’t drive off with the parking brake on. When you disengage the parking brake, the respective light should go off. If it does not, you might have a problem with the parking brake itself, or the light could be indicating a problem with the other braking system of your car instead of the parking brake. As you can see, some cars indicate that brake pads need to be replaced with a light that reads “BRAKE”, while other cars use that light to indicate that the parking brake is engaged. It’s a good idea to consult your Owner’s Manual to determine what that light means on your particular car. These lights refer to your car’s Anti-Lock Brake System. When any of these lights are on, it’s to warn you that there is a malfunction somewhere in the ABS. It is safe to drive the car with this light on, and the brakes will work normally, however, when this light is on, the Anti-Lock Brake System is OFF and will not actuate under emergency or hard braking. Again, it is fine to drive with this light on, just be aware that you will be driving as if your car does not have an ABS system and if you slam on the brakes you will not have the anti-lock system to assist you. NOTE: If the Anti-Lock Brake System light is on in conjunction with another brake warning light, you should have your vehicle looked at immediately. It could be just a low brake lining light, or it could indicate a potentially very serious hydraulic failure in the brake system and your car may not be safe to drive. These lights are variants of the Air Bag warning light. When one of these lights is present, the Air Bag system (or Supplemental Restraint System) is turned off due to a malfunction in the system. It is safe to drive the car, but keep in mind if you are involved in an accident, the airbags WILL NOT deploy. A wire may be unplugged, a seat belt buckle may need to be replaced, or a weight sensor might have gone bad…have a professional diagnose and repair the system as soon as possible so that you will be protected in the event of a crash. This array of lights is connected to the various traction control systems for different cars. Reading what these mean can be somewhat tricky, as they can be either indicator lights or warning lights, depending on when they’re present. The “BAS ASR” and “BAS ESP” lights are the only two that are NOT indicator lights, and will only be showing on your dash if there is a malfunction in the system. Mercedes Benz uses these lights to warn you that the system has detected a fault and has temporarily disabled itself. All the rest can be both indicator AND error lights. In order to determine if the light on your dash is simply telling you the system has been manually turned off, or if it’s telling you that the system has a problem, push the corresponding traction control system button your car has. BMW uses ASC and DTC and DSC, depending on the year, model and options your car has, and other car manufacturers use other symbols or acronyms. If you have manually disabled the system, the light will be present on your dash to remind you that you will not have the assistance of traction control in an emergency situation. If you turn the system back on, the light should turn out. If attempting to turn the system on does not make the light turn off, then the light is present to indicate a malfunction in your car’s traction control system. The car is safe to drive, and will act normally, however the traction control system will remain DISABLED until you have a professional diagnose and rectify the problem. Again, refer to your owner’s manual to familiarize yourself with the systems your car is equipped with and what lights correspond to your particular system. The following lights monitor different fluids in your car. This light is in place to alert you in the event that the level of antifreeze in your cooling system becomes lower than normal and should not be ignored! It might be telling you that the coolant is a little low, which is normal over a long enough period of time and requires only that you add what is needed. On the other hand, it might be alerting you to the fact that there is little or no coolant in your cooling system, which could very easily damage an otherwise healthy engine beyond repair. Watch the temperature gauge in your car to see if it is indicating a temperature above the mid-way point. If the temperature begins to climb and approach the red, turn the car off immediately and have it towed. The tricky thing about this is that if you have a massive coolant leak and there is not enough coolant left in your tank for the sensor to pick up, the temperature gauge may flicker or continue to read normal even though your car is overheating. The best thing to do is pay attention…Do you see any steam rising from the hood when the car is stopped? Do you smell anything out of the norm? Check your coolant level and see if it is indeed dangerously low. However, NEVER REMOVE THE RADIATOR CAP FROM A HOT ENGINE! Let it cool down for at least 30 minutes as it is under pressure and the temperature of the steam could easily scald you. Another important thing to remember is that not all cars have a low coolant level warning light…your only warning could be the temperature gauge creeping up, so make sure to check it often. If you have a low coolant light and see that your engine is overheating, TURN IT OFF IMMEDIATELY and have it towed to your service facility. Continuing to drive a car that is overheating can destroy your engine in a matter of minutes! These lights, and others similar in appearance, turn on to tell you that your engine is beginning to overheat. Not all cars have a separate temperature warning light, so the temperature gauge beginning to rise may be the only warning you’ll be given. A good place to start troubleshooting is to check the level of coolant. NEVER REMOVE THE RADIATOR CAP UNTIL YOUR CAR HAS COOLED FOR AT LEAST 30 MINUTES! The system is under pressure and the steam will cause scalding. There are several different things that could cause the coolant to leak out: a bad radiator, a faulty water pump, any of the coolant lines, etc. The best idea is to turn the car off immediately and have it towed to your service facility. Continuing to drive a car that is overheating can be catastrophic to your engine and can damage it beyond repair after only a few minutes. This light is another light that should NEVER BE IGNORED! This is your oil warning light and when it is illuminated, it is telling you that your car does not have sufficient oil pressure to continue to run. Monitor your dash for this light and in the event that it does come on, PULL OVER AND SHUT THE CAR OFF IMMEDIATELY! Running an engine dry will damage it beyond repair quicker than you’d ever imagine! Use the dipstick to check the oil level and add as needed to bring the level up to the ‘full’ mark. If you do not have oil with you, DO NOT try to drive somewhere to get some. Call a tow truck and have it towed. In some cars, the oil light can appear in 2 different colors. An orange oil light indicates that your oil level is low, while a red one indicates that you are out of oil. There is no way to tell if your car offers this more advanced warning system without reading the owner’s manual, so it’s a good idea to do so before assuming that an orange oil light only means that your oil level is low. Again, this light could indicate a very serious problem and should never be taken lightly! This indicator is warning you that your brake fluid level is low. This could be due to several different factors, and could indicate simply that your fluid is just a little low, or that it is dangerously low and that the car is unsafe to drive. Monitor the way your brake pedal feels, if it feels unusual or goes to the floor, the car is not safe to be driven as the brakes may fail altogether. Have a professional ascertain where the failure occurred and what needs to be repaired in order for your car to be safe to be driven again. This icon is warning you that your automatic transmission fluid is overheating. This could be caused by towing a heavy load or doing a lot of uphill driving, or it could be caused by a malfunction in your transmission. Pull over so that the transmission fluid can cool down, leaving the car running so that the transmission fluid will continue to circulate and cool more quickly. Wait for the light to go out before you continue driving, as continuing to overheat your transmission could be a costly mistake. Have your technician diagnose the problem as soon as possible to avoid the potential of causing damage to your transmission. This light is simply alerting you to the fact that your windshield washer fluid is low. Just add more when you get a chance, especially in winter when you will need it to wash the salt off your windshield in order to see. Any icon that looks something like this is indicating that a light is out on your car. It is usually warning you about a headlight or tail light, but on more advanced systems, there might be warnings in place for fog lights, tag lights, and turn signals as well. Make sure to check tail lights, brake lights, headlights and turn signals to avoid being pulled over and to make sure you’re safe on the road. These indicator lights are simply to confirm that either your fog lights or your brights are on (respectively). They will go off when those lights are turned off. 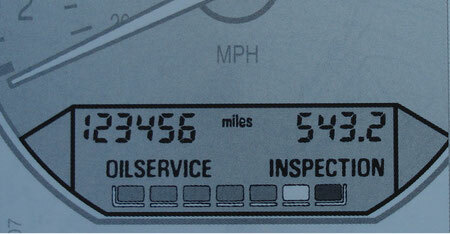 The following icons are different variants of your check engine light. These lights are tripped usually when your engine is not operating at peak performance: it could be an oxygen sensor, an emissions problem, spark plugs, or even a loose gas cap that could set this light off. The only way to tell why this light is on is to have a professional hook up a diagnostic computer to your car and read the codes that are stored in your cars computer that caused this light to come on. For the most part, your car may not run its best and may use a little more fuel than normal, but more often than not, it is safe to drive your car with this light on, although in some rare instances, continuing to drive with this light on can cause damage. Most of the time, it is simply indicating that your car is not running its best. Your service technician can diagnose the problem and recommend a remedy to get your car back to running at 100%. Again, the best idea is to have your technician tell you whether it's safe to keep driving or not. The EML light refers to your electronic engine power management system. This system uses an electronically controlled throttle, as opposed to the older fashioned cable or linkage controlled throttle. Having the throttle controlled electronically, which is also sometimes referred to as “drive by wire”, enables the car to have a more advanced traction control system. By allowing the car to electronically modulate the throttle, it provides the car’s computer system with the added ability to apply power to the wheels as needed, in addition to being able to apply braking as needed, to help you regain control of your car in the event you loose traction and begin to slide or skid. Many cars will not have this ability at all, as it is a newer technology…even cars with traction control may only have the ability to apply braking as needed. This is an additional system that facilitates even greater precision in car control. These lights have to do with your car’s transmission. The AT Trans Temp light indicates that your transmission fluid is overheating, possibly because you are towing a heavy load or are doing a lot of uphill driving. Pull over and let the car remain running to let your transmission fluid cool down. Wait for the light to extinguish before continuing to drive, as continuing to allow your trans fluid to overheat could cause costly and possibly irreparable damage to your transmission. Have your technician diagnose the problem to make sure your transmission is OK. The other light is a sort of check engine light for your transmission. Again, there is no way to determine why this trans error light is on other than to have your service technician plug into your car’s computer to read the codes that the transmission has set to indicate what kind of problem it is experiencing. In some cases, it might be a minor fault. In other cases, it could be a major fault, and continuing to drive the car could cause further damage. The best idea is to stop by your shop and have the problem diagnosed right away to make sure that continuing to drive it will not cause any further damage. These warning messages have to do with your steering wheel. The one indicates that the electrically adjusted steering column is not locked into place. The other is to warn you that there is a fault in the active steering system of your car. Refer to your owner’s manual to determine what the illuminated light on your dash means. Many cars will not have either of these lights, as many cars do not have electrically adjustable steering columns or active steering in the first place. These next symbols have to do with your Tire Pressure Monitoring System. This system electronically monitors the air pressure in each of your tires and is in place to alert you should one of your tires begin to loose air pressure. Don’t panic if this light comes on however. Many systems are very sensitive, and alert you if a tire becomes even 2 or 3 psi below the recommended inflation rating….at the same time, don’t ignore this warning either. It’s a good idea to stop the car and take a look to see if any one of the tires looks significantly low, or better yet, stop at a gas station and use a pressure gauge to take readings from the tires and of course, add air as needed. These two symbols deal exclusively with diesel cars. The first is to warn you that there is water in your fuel system that needs to be drained from your fuel filter. This is a simple procedure, and you should refer to your owner’s manual for instructions. However, do not ignore this light! If water finds its way into your fuel system, it could cause extensive and possibly even irreparable damage. The second symbol is a glow plug indicator. This is to just to tell you that the glow plugs are warming up in preparation for a cold start. Wait for this light to go out and then start the engine. These two indicators, as well as possibly others, are your cruise control indicators. Some cars do not have any indicators to tell you that the cruise control has been activated, others use symbols like these. When the cruise control is on, these symbols, or symbols similar to these, are illuminated. Conversely, when the cruise control has been deactivated, these symbols will no longer be visible in your instrument cluster. This is your seat belt light. Many older cars illuminate this light to remind you to buckle your seat belt and then it goes off after a few seconds, while newer cars will leave the light on until you buckle up. Once the belt is buckled, the light should extinguish. If it stays on even though your seat belt is buckled, there is a problem either with a sensor in the belt buckle or perhaps a wire under the seat has come unplugged. Both are easily repairable and your service technician should have no problem either replacing the buckle or repairing the wiring. This is another light that should not be ignored. This is your battery light and it comes on to warn you that your charging system is not working properly. Usually this light is indicating that your alternator is about to die. Turn off any unnecessary accessories that draw electricity, like the heater, A/C, and all lights (unless of course it’s dark out), and quickly get to the nearest place that you can leave your car and wait for a tow truck safely. Once that light comes on, you may only have a few minutes before your car dies, and you don’t want to be stranded in the middle of a busy intersection when it does! This light is a low gas light. Some cars don’t have a low gas light warning, so don’t rely on it to tell you when you need gas. This is an emblem that you probably won’t ever see as it’s mostly only on European cars, but it indicates that the catalytic converter is overheating. This could be due to a failure of the cat itself, and should be looked at by a professional to determine the nature of the problem. This light simply indicates that the power convertible top is being operated. Never try to open power tops while driving, and never begin driving unless it is all the way open or all the way closed as you can cause extensive damage to the moving parts of the top. These lights, and many others that look similar, are alerting you to the fact that a door or trunk lid has been left open. Check all doors before continuing on to make sure they’re all shut. If this light remains on even if all the doors are shut, you may have a defective sensor in the door latch that is failing to inform the car that the door is indeed shut tightly. The subsequent lights are found on later model cars. They indicate that some kind of service or regular maintanance needs to be performed. They will of course vary from car to car, but this is what they may look like. These lights and others like it are different service indicators. Each car manufacturer recommends that you have routine maintenance done on your car at specified intervals, and newer cars will alert you when one of these intervals has arrived by illuminating a light like one of these. Your owners manual should tell you what maintenance is recommended when, which should give you a good idea why the light is on and what needs to be scheduled for your car. Your service technician should also have a resource for each car manufacturer that also lists what should be done and at what mileage intervals. Another resource for generally recommended maintenance can be found in the service section of this web site. This light, lights similar in appearance, and perhaps many other types of indicators, alert you to the fact that your oil needs to be changed. However, many cars do not have any lights that perform this convenient function. This light is usually based on a combination of mileage driven and time elapsed, as well as sometimes more advanced indicators. While these lights are useful and should always be taken notice of, the best advice is to always monitor your oil change intervals. Oil changes are often overlooked, as not changing the oil does not immediately produce a decrease in performance, or any other immediately visible results. However, oil changes are arguably the most important maintenance you can and need to do to your car. If oil changes are left undone, the oil filter eventually collapses after being clogged with contaminants and hence cannot allow enough oil to pass through it to properly lubricate your engine. This lack of lubrication can produce catastrophic and enormously expensive results, which are often irreparable. BMW, for example, recommends synthetic oil changes every 15,000 miles. It’s true that synthetic oil can go many more miles without being changed than regular oil, but 15,000 miles is way too much for even synthetic oil, let alone the filter, which is the same whether it’s filtering synthetic or regular oil. Regular oil should be changed every 3,000 miles or every 3 months, especially if you're not making any long trips, as the oil does not heat up enough to burn off contaminants in the oil with short trips. Conversely, if your driving habits consist of mostly hour long trips, for example, you can extend that oil change interval to 4,000 miles if you'd like. Synthetic oil should be changed every 5,000 – 7,500 miles. This service indicator is specific to BMWs. It has 3 different color lights that correspond to different things: green, yellow, and red. The green lights will start out all lit, and will decrease as time counts down to your next service interval. When a yellow light appears, it indicates that service is due, and will be accompanied by either the message “Oil Service” or “Inspection.” Together with Oil Service simply indicates that the cars timer for your next oil change has indicated that enough time or miles have gone by and an oil change is in order. A note concerning this interval however, many newer BMWs recommend oil changes at every 15,000 miles, and this is way too far to drive between oil changes. The oil filter collapses as it gets inundated with contaminates and runs the risk or starving your engine of oil, which could be paired with catastrophic results. The best idea is to keep track of your oil change intervals yourself and not rely on that counter, changing regular oil every 3,000 miles or every 3 months (unless the miles consist mostly of long trips, which allow the oil to heat up to the temperature where it's able to burn off many contaminants in the oil, in which case you can get away with extending the interval to 4,000 miles if you want), and synthetic oil every 5,000-7,500 miles. When that yellow light is accompanied by the Inspection message, it is indicating that your car is ready for either an Inspection 1 or Inspection 2 service. These services, Inspection 2 being the more involved service, change things like interior cabin filters, air filters, fuel filters, etc, as well as lubricate components of your car and inspect just about every inch of your car for weaknesses or needed repairs. Your technician should be able to tell you which service is needed based both on current mileage and when the last Inspection service was performed. Finally, when a red light appears in this field, it is telling you that service is overdue. If you don't see what you're looking for here, you can ask us. Fill out the form and describe the icon you're asking about, as well as any symptoms that went along with it. If you can, take a picture and e-mail it to us at s.h.i.c@comcast.net. Otherwise, we'll do our best to answer you based off your description.